Hand #214 - Jared Davis has the button, and he's all in preflop with against Don Baruch's . Davis will need his hand to hold up to stay alive. The flop comes , and Baruch takes the lead with two pair, queens and nines. Davis's best hope is an ace. Jared Davis is eliminated in second place, earning $149,263. 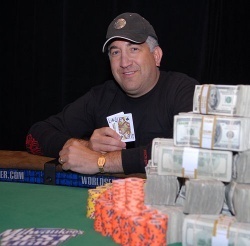 Don Baruch wins Event #21 ($1,500 No-Limit Hold'em Shootout), earning $264,107, a Corum watch, and a coveted WSOP bracelet. The break is over and heads-up action resumes. There is a short break in the action as the broadcast crew swaps new tapes into the equipment. Hand #197 - After a flop of , both players check. The turn card is the , Davis bets, and Baruch calls. The river card is the , and both players check. Davis shows , and Baruch mucks. The holecam shows that Baruch held .